Our day started in the Cairngorm Mountains at the Old Pine Yurt, see my Blog at this link: (Old Pine Yurt). Our day would end at John O'Groats, Caithness, Scotland. 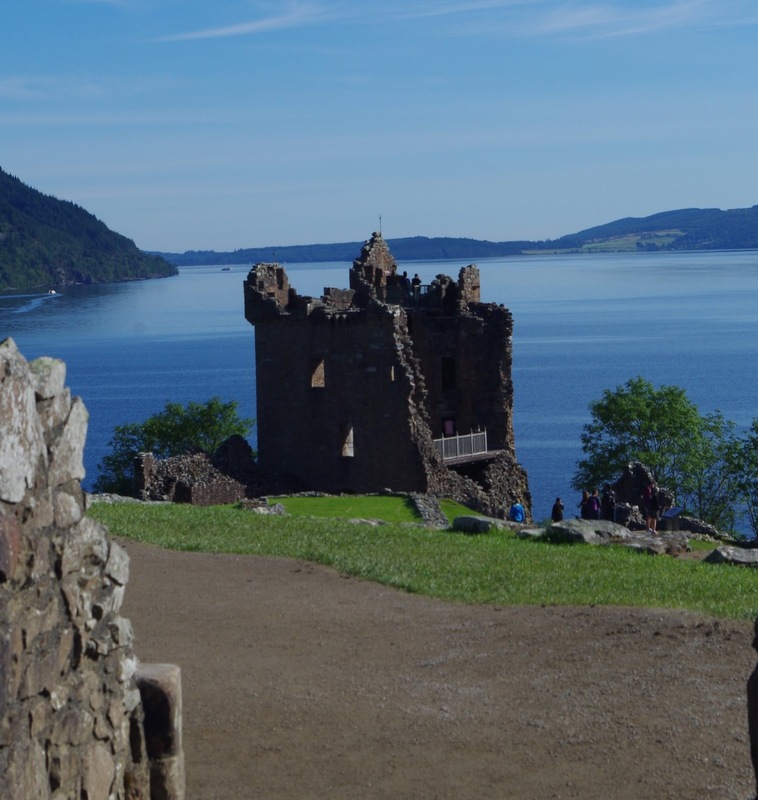 The start and finish of the North Coast 500 is Inverness, the capital of the Highlands. The North Coast 500 is a tourist board initiative to attract more travelers and tourists to the less visited areas of Scotland. Check out their website here: (northcoast500.com). Being who I am, I am not fond of being told how to do a trip, much less where to go, what to see and where to stay. As such, right off the top we navigated the NC500 counter-clockwise!!!! OH MY, WHAT HAVE WE DONE!!! Have no fear, the scenery is just as beautiful in the reverse direction. What did day one look like, really.....well, we were up at 0630ish and on the road by 0740. First we drove to Inverness, the official start point of the NC500. 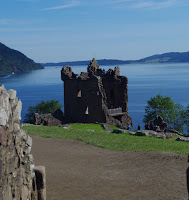 As we had already done our business in Inverness a couple days before we headed West to Urquhart Castle (see my Blog here:urquhart-castle-shores-of-loch-ness ) for some family pictures. We planned for a quick trip. We arrived at 0927 and departed at 1025. Funny how these things occur. Quick is relative and on this adventure one hour turned out to be the average time spent on a quick stop. We have the photos to support our claim that these stops were not wasted. The parking fills up fast at Urquhart, so arrive early or just before the end of the day. With a quick exit we back-tracked to Drumnadrochit and cut over to Beauly, then Dingwall to refuel (about 1145.) Despite a traffic accident on the A9 we managed a lunch break in Brora around 1325hrs. After lunch we continued North and our next stop was near Latheron at the Clan Gunn Museum. We stopped here on our visit in the 1990's and we enjoyed this visit, too. For those searching for family history or general history about this area, the Clan Gunn Museum holds a wealth of information and the staff are always very friendly & knowledgeable. time here. It was walking distance to town and the harbour. This was important because we had booked a 1 day private guided tour of Orkney with Jean Ross of Great Orkney Tours (greatorkneytours), see my Blog here: (standing-stones-stones-of-stenness ) & here: ( ring-of-brodgar-orkney), for two of our stops on Orkney. Well worth the side trip if you make it as far North as John O'Groats. Before I get too far track.....after securing our camping & parking spot for two nights, it was over to the John O'Groats Ferry to pickup our tickets for the crossing in the morning. More info on the JOG Ferry here: (jogferry). Book online before you arrive. Summer is a short busy season. Space is limited. Arrive early as the morning ferry is known to depart a wee bit early. This ferry does NOT carry cars or other vehicles. Vehicle ferry service is provided by Northlink Ferry (northlinkferries/scrabster) and they depart from Scabster, a short drive West from John O'Groats. The Northlink Ferry depart Scabster and arrives at Stromness, Orkney. 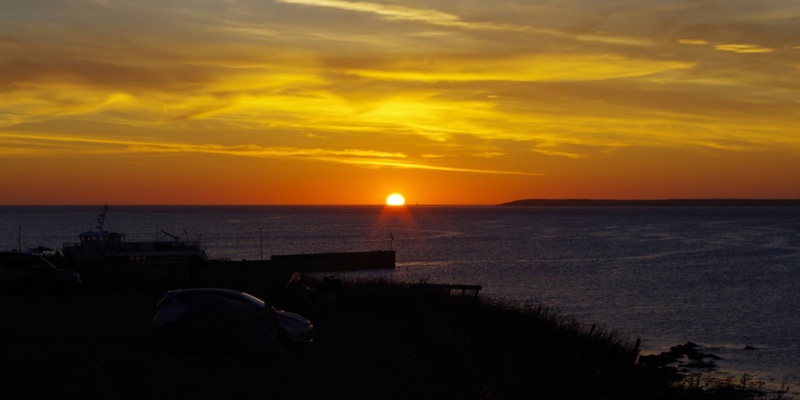 We did not wish to take the rental to Orkney, thus the want for camping/parking at John O'Groats. After setting up our tent, we walked into town in search of a meal to end our day. Place number one, The Storehouse, although 20 minutes before they closed asked us to try another restaurant as they were closing soon. (I have yet to write my TripAdvisor review on that place, but it will be my first with a negative review.) The place they recommended was closed, no reason as to why. We never did attempt to see if they were open on a different evening. We did make our way closer to the harbour and discovered The Cabin of John O'Groats (tripadvisor.ca/-The_Cabin_at_John_O_Groats). This is one friendly chippy stand. 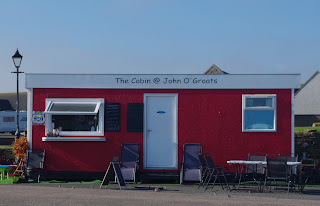 In fact we would eat all our meals from The Cabin, while in John O'Groats - 2x Supper & 2x breakfasts. This was the only location that we showed our North Coast 500 membership card that offered a membership discount on purchases. We ate our supper in our rental and watched the seals play in the surf just off the shore from our campsite. This was an awesome first day on the North Coast 500. Headed into the tent around 2145 hours. 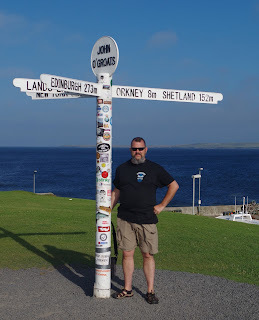 The Tomb of the Eagles, Scapa Flow, Stones of Stenness, Ness of Brodgar, Brough of Birsay, Lunch at the Orkney Brewery, Skara Brae, Ring of Brodgar, St. Magnus Cathedral, the Italian Chapel, Hoxa Head before returning to Berwick to catch the 1900hrs JOG Ferry back to John O'Groats. Our ferry departs Berwick at 1915 and arrives in John O'Groats at 2001hrs. We stop by The Cabin and order take-away. Again, we select the rental as our dining room with a view, without a breeze. By 2138 it is time to hit the hay. Our new tent serves us well. It is an Asolo Velocity 4, a great car camping tent. With more than enough room for the three of us. The aluminum poles and the full coverage fly keep dry and secure against wind and rain. I have tried to provide enough photos to give a fair representation of what our trip on the North Coast 500 was like. I hope you do not mind that the text is not co-located with the pictures. 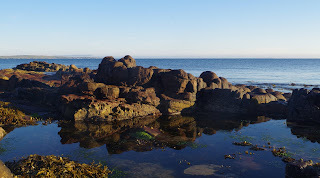 Day 3: North Coast 500. After two long hard days of adventure we are a bit slow getting out of the tent today....0730ish. Once we are packed up and road ready we checkout and park near the info-centre. Head over to The Cabin for a full breakfast this morning. Next time we are in the area we will try the Haggis at The Cabin. A local favourite. The supplier unfortunately, had taken 3 weeks vacation and The Cabin had sold out a day or two before our arrival. Too bad, next time. We spent a bit more time in John O'Groats purchasing souvenirs from a few of the shops before continuing on the A836 (1043hrs) to Dunnet Head Lighthouse. There is a short trek off the A836 on the A855 single track to get to and from the lighthouse. It is worth a visit. This is the most Northerly point of mainland UK. 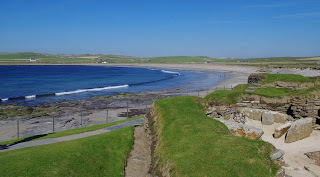 We could see across to Stroma and on the far horizon was Orkney. Depart around 1141hrs. From Dunnet we continued on to Thurso (1237hrs). Snapped a few pics of their castle. 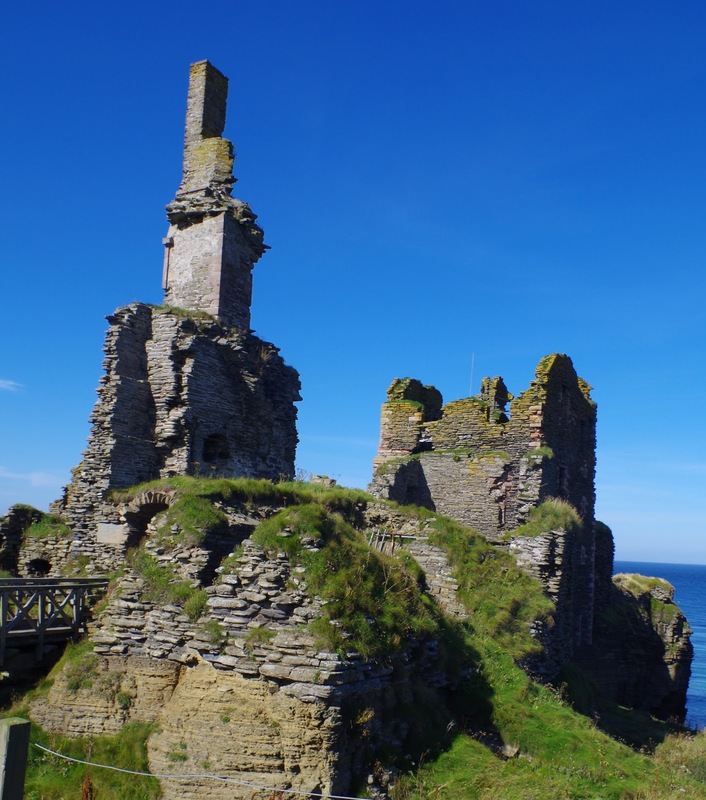 The ruins of Thurso Castle are there and easy to get to, however, they appear to be neglected. No formal method of promotion or repair appears to be occurring. Too bad, as these ruins could be capitalized on, to both save the castle and promote Thurso. 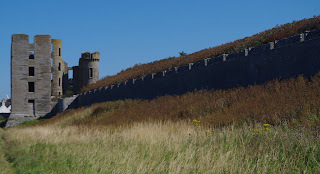 I am sure the views from the turret and castle walls towards the Thurso Harbour would be very good. We continue across the top of Scotland on the A836. I do not have any other entries in my travel journal until we stop to refuel in Tongue (1537hrs). From the service station we drive down to the Causeway and take a few pictures before backtracking so we can take the old road around the Kyle of Tongue. The old route is single track and traverses quite a ways inland. The scenery is breath-taking and on a clear day like we had, well worth the detour!! 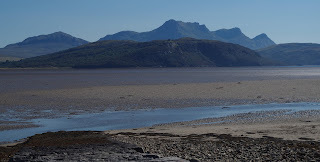 In the Kyle, there is an outcrop with the Castle Varrich perched on top. This was a strong hold for the Clan MacKay. Had we known it would be here, we would have budgeted more time for hikes. There is a road up to the castle but that is for hiking not driving. We wanted to make it to Durness this day, so an hour and half to hike to a castle was not in the plan. I tell you so you can plan your trip accordingly. In the distance was a very noticeable mountain. I am sure it holds a Ben ____ type name, but I did not record it. Direction wise it could be Ben Kilbreck, but I think that is too far away. It was not Ben Hope, since that is in the wrong direction. 1612hrs We are still on the Old Road but enjoying our trip. We did not encounter very many vehicles on this route. With the Causeway, I suspect most folks just blast through this area. In my opinion, the North Coast 500 is not being fully enjoyed by travelers. I will speak more about this later. Upon our return to the A836 at the far end of the Causeway we continued West, arriving around 1740 at the Smoo Cave Hotel, Durness for supper. This was one hopping little establishment. The food was plentiful and delicious. Our only concern was, once finished our meal we felt like we were abandoned. Now maybe it was our misunderstanding the culture of this establishment. Maybe, like the Glen Avon Pub in Tomintoul it was our responsibility to go to the bar and pay our bill. However, we eat well and enjoyed our meal. Then it was back to Durness to find a place to pitch our tent for the night. We find ourselves at Sango Sands Camping Site. We pick a pitch in the upper tenting area. 1942hrs the tent is up and it is now time to find a wi-fi connection. Sango Sands Oasis, I believe was the name of this establishment just beside the campground. Anyway, they had wi-fi and beer. Only 231 unread emails, oh my. I had an Orkney Brewing Co. - Dark Island Ale. Tasty! 2130ish Head back to the tent. Another day of adventure awaits the rising of the sun. Day 4: 0720 Fogggy!! There will be no sun here anytime soon. No need to get up quickly. Wait an hour, no better. It could be foggy for a week. Time to get started. Pack up our camp and load up the rental. Head over to the tourist bureau, then walk down to Smoo Cave. Okay, for this site, the fog adds a new level of intense. The fog filled the fjord in the mouth of Smoo. I had to practice my Norse Foghorn by calling out O-D-I-N, like they did in the movie 13th Warrior. I am sure if the locals were to hear that it may bring back some tales from yester-yesteryear of Viking visits along their coast. Smoo Cave was in fact a hideout used by many trying to keep beyond the long arm of the law. So, the fog added to the experience of this visit. Thanks to the NC500 website we decided we needed to visit. It is a very large cave. Next time I think I will even invest the required funds to take the boat ride into the deeper reaches of this cave system. For this visit, we were all happy enough with the walk down to the cave and the boardwalk into the cave. Next we were off to Cocoa Mountain in Balnakeil, for fresh hot chocolate and yummy cookies. This was a side journey from Durness but not far, nor difficult to find. Imagine if you can, hot chocolate made from freshly melted chocolate.....not that powdery crap they sell at Tim Horton's or any other restaurant for that matter. This was decadent. Yes, it was foggy here, too. So, with bellies filled with rich, warm chocolate it was time to hit the road in hopes of getting beyond the fog. Hard to see the sights when the fog limits visibility to a few hundred meters or less. 1119hrs We depart Balnakeil. Somewhere along the A838 around 1210hrs the sunshine returns. Finally, we are beyond the fogs of Cape Wraith. Next village is Rhiconich. We take a side tour up/down B801 on Loch Inchard. We travel as far as Kinlochbervie. We purchase some snacks and enjoy a few minutes break near the harbour. 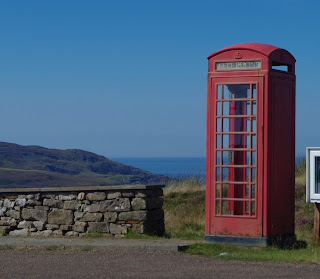 On our return to the A838 we stop at the Kinlochbervie Cenotaph to click a few pics. Here is an amazing Celtic Cross, as well as, some history. A young man from this area was recognized for his efforts to save his fellow comrades during the Great War. For his efforts he received the Victoria Cross, the highest award for bravery for Commonwealth military personnel. Turns out there is a Canadian link to this story about Robert Gordon McBeath, VC; after the war he and his wife moved to Vancouver, BC. Working as a member of the Vancouver Police Dept, while on patrol on Granville Street he and an off-duty detective try to stop a drunk driver. The driver resisting arrest, engages in a physical altercation resulting in R.G. McBeath being shot in the heart, causing his untimely death at 24 years old. His resulting funeral was the largest in the City of Vancouver's history. We return to the A838 and continue our Southerly journey. The A838 becomes the A894. Crossing the bridge at Kylestrome to Kylesku we notice a waterfall. A short drive and short hike to capture a few photos later and we are back on the road. Not fearing the road less traveled, we decide to take the long way around the B869. We make way to Drumbeg. 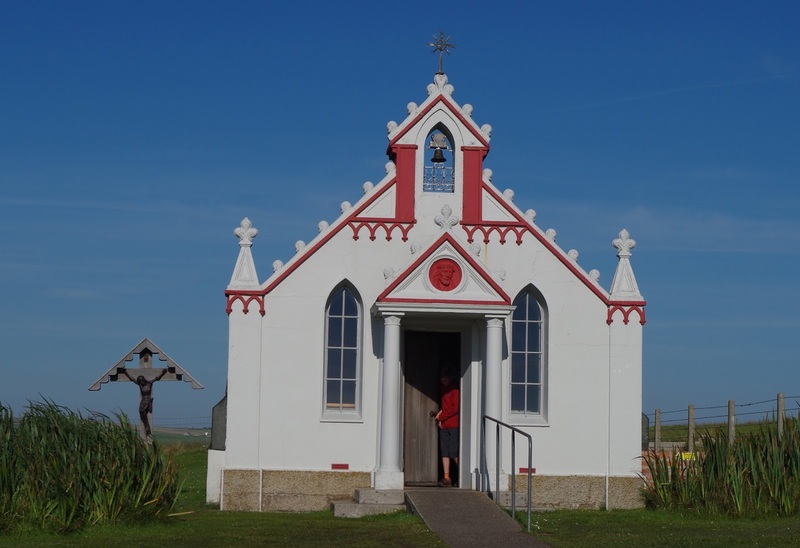 We had collected a coupon at the travel bureau or campsite to a shop in Drumbeg. The owner, very pleased to see us, honoured the coupon although it was for items we were not purchasing. He was happy to see his advertising budget was attracting some customers. So, if you are traveling the North Coast 500 and pass through Drumbeg, you will want to visit their shop: The Candle Shop & Secret Tea Garden (thelittlesoapandcandlecompany). They make very nice hot chocolate, as well as, soap and candles!! With our beverages and snacks consumed we are safe to continue along the single track to get back to the A837. Departing Drumbeg around 1514hrs. Yeah, we finally arrive back on the A837. That was some serious driving along the B869. Good practice for you up-in-coming rally drivers!! collection of shots that have a vibrant blue sky background to a bunch with the stormy, grey skies and green hills as a back drop. These photos are very bold. Very vivid. Here is my link to my Blog: (ardvreck-castle-shores-of-loch-assynt ) where I have my pictures of Ardveck Castle. We depart Ardvreck at 1655hrs and make our way to Ullapool for our next camp. We find space at the Broomfield Holiday Park in Ullapool. Once camp is set we walk into town. Ullapool is set against the harbour and is very walkable. 1835hrs We find supper at the Seaforth Bar & Restaurant. Although, we got misplaced, we did eventually, get fed. It was a very busy night but after an hour from when we placed our order and still had not received it, we asked if it would be much longer. The staff discovered our order had been lost and got us food very quickly after that. These things happen. The food was good. Around 2015hrs we were all settled up and exploring the streets of Ullapool and any shop that was still open. We returned to camp around 2118hrs and quickly took shelter in the tent away from the merciless midges!! As much as I hated to miss this section, I also knew it would be a long drive on a minor roadway. More reasons for a return visit. By noon on the 19th of August 2016 we had arrived in Fort William. 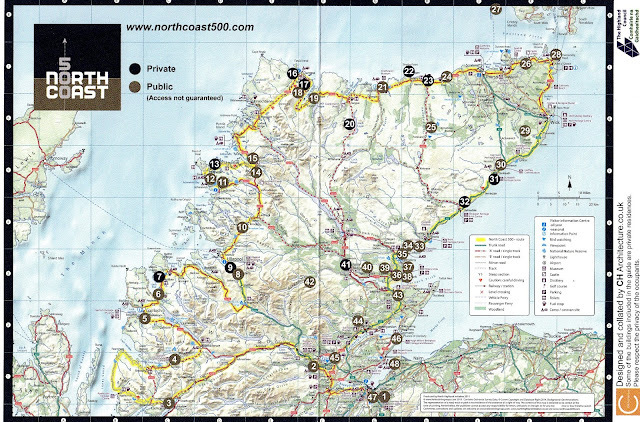 The North Coast 500 is a great idea. Give travelers a purpose to go places they might not normally go. 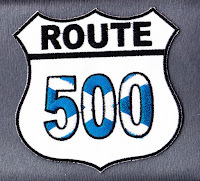 Now, what did I learn on the NC500......first, more businesses along the route need to buy into the idea of the NC500. They need to believe in it and support it. 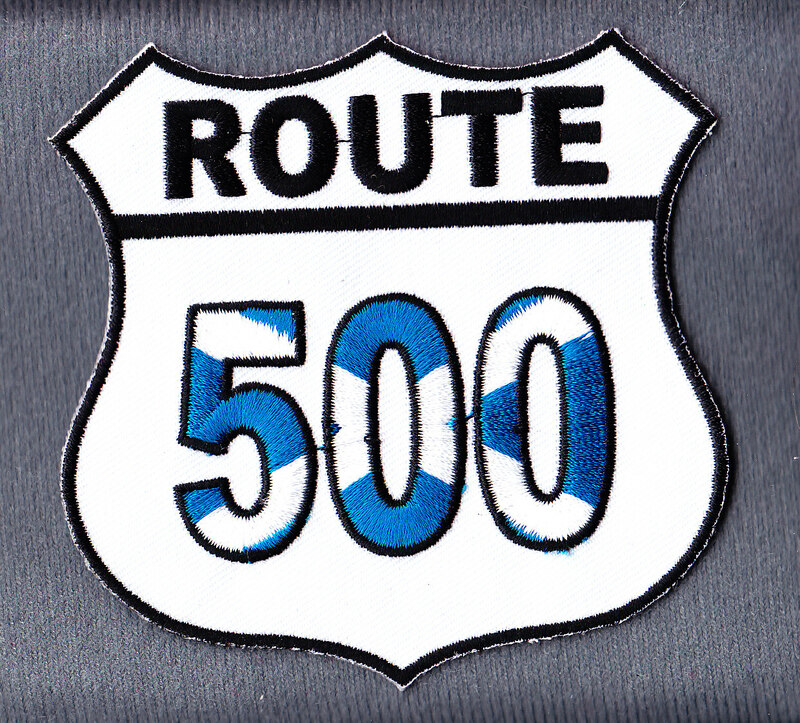 However, before that will happen the organizers of the NC500 have to do their part, too. From the business owners I spoke with along this route, the one message that came back to me over and over again was: Sure, there are lots of vehicles driving the NC500, the problem is they do not stop and buy anything - except fuel and food. Most drivers are on the route to see how fast they can complete it. So, here is the challenge: How do you keep the travelers on the route a few days longer?? How do you make it easier for the traveler to spend money while on this route?? How do you make it easier to become a member of the North Coast 500?? Especially, for those who come to Scotland from around the world?? One thought I had while traveling the NC500, was why not have a passport system. 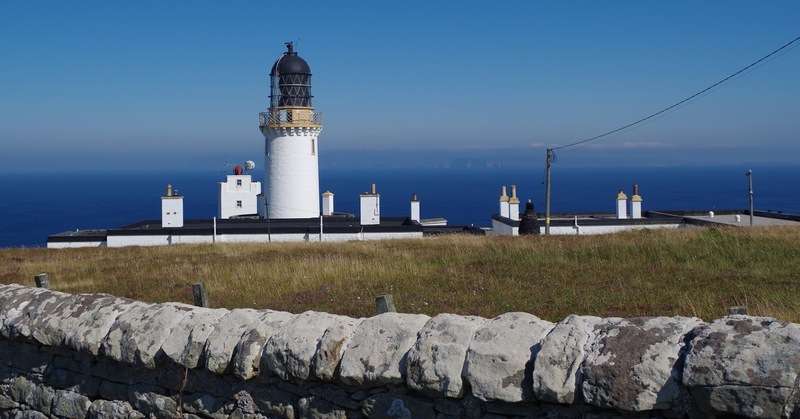 This would encourage NC500 members to stop in multiple locations to get a stamp in their NC500 passport. The more stamps, the more opportunities to win prizes. We covered this route quite quickly in just five days, 7 days would be a better amount of time to set aside, and 10 - 14 days would allow you to really get out and explore this region of Scotland. North Coast 500, I hope you are listening. You have a diamond in the rough right now, but the potential to have a priceless gem in your hands is there, you just need to polish your idea....just a bit. 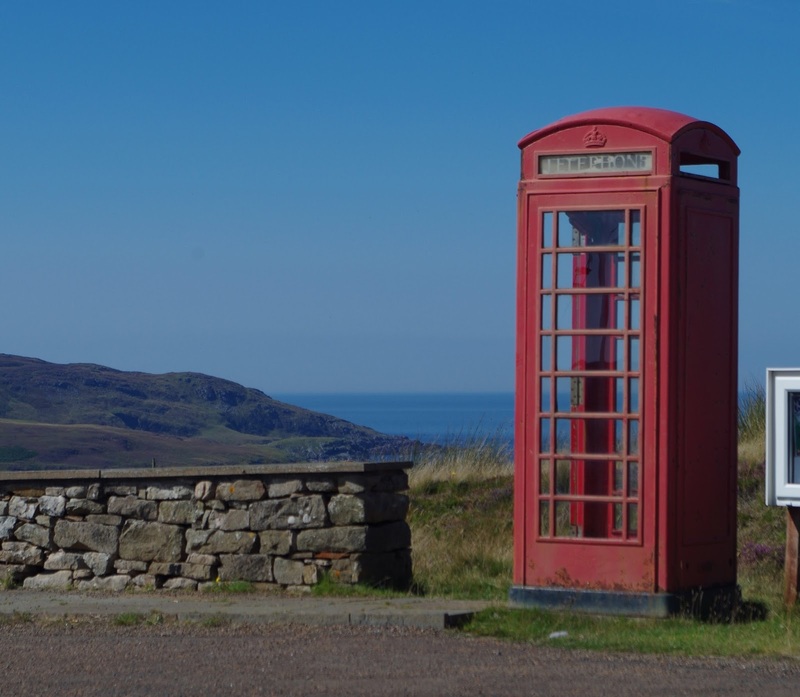 Businesses along the NC500, you need to get on board and support this idea if you want to see a return. This idea needs team work, the goose that lays the golden egg does not happen without some food and water. Welcome back for part three of standing stones. This time we visit Stonehenge, the standing stones on the Salisbury Plains of England. These are probably to most known standing stones in the world. Again, I am not a historian and do not pretend to be so. I enjoyed traveling to all these sites to capture their images for my personal enjoyment. What I do know/understand is that this awesome site was built by the Druids at least 3000 years ago. The majority of the stones came from a quarry in Wales more than 200 miles away. Even today, to build a stone structure so far from the source stone would be a major undertaking. With no machines to cut the stone nor machines to transport the stone.....this was a fantastic feat!!! Our visit was made possible by booking an unguided coach trip from London, I believe we found our tour operator Evan Evans Tours (Evan Evans Tours ), with the help of Tripadvisor (Tripadvisor & Evan Evans Tours ). We opted for a direct half-day trip to and from Stonehenge. We did not want a guide and we did not want to have any other stops on our adventure. Our adventure required a train ride in from Horley and then a walk to Evan Evans Tour office....easy to find from Victoria Station. Now this was promising to be an outstanding day, clear skies and temperatures forecast to be in the low 30's (+30 Celsius/+86 F), thus a nice warm day....one of the warmest day during our three weeks in the UK. So, a coach ride with a/c would not be a bad way to spend the warmest part of the day. Now, Evan Evans Tours are not big on customer comforts before the ride, nor on the ride for that matter. They do not have a washroom at their office that you may use nor do they have washrooms on the coach we rode on. Further, seating is very limited at their office. Just know this before showing up. One last point, due to the volume of vehicular traffic in London do not expect the coach to wait for you to arrive, they do try to depart right on time. I was very happy to not be driving in the throng of London metro traffic. One reason for taking a coach tour was to avoid the stress of route-finding and general traffic issues. I wanted to enjoy my day. The trip to and from Stonehenge was uneventful. Now, upon arrival at Stonehenge it is a bit of a cluster.....we had ONLY 90 minutes to walk from the bus parking area, get on the shuttle bus for the trip to Stonehenge from the visitor's centre. Enjoy Stonehenge. Catch another shuttle back to the visitor's centre. Buy souvenirs at the gift shop. Visit the washroom. Walk back to the coach. Now, we did not drag our arses on this trip, and we barely returned in the 90 minute time limit. A more realistic window would have been two hours, from dropoff til departure. Three hours if you want to walk to Stonehenge from the visitor's centre. Like many of the sites we had the pleasure to visit during our trip, this site had huge crowds. So, maybe my next visit would employ a private guide to see this site before or after the huge crowds are here. I worked very hard to get shots with as few people in them as possible. Of course, I had to take more than 300 shots to be able to show off a dozen. But, I have no regrets. It was awesome to be here. In fact, in the short time it took to orbit the Stonehenge the skies had changed from clear, blue with high white cloud to an almost threatening grey sky. Very magikal!! There is more than luck and hardwork to this site. Stonehenge is a great work. I was amazed to find that the angles of the stones when seen against the stones on the far side of the circle actually lined up. The amount of skill to achieve that is hard to calculate. No lasers. No computers. No school of engineering. No trig. Maybe a plumb-bob. Maybe a straight edge. Probably chaulk to mark the cuts. A true sense of awe!! Enjoy, the remaining pictures. I really enjoyed taking them. It was worth the time to come visit. Until next time....go see the World!! Bring your camera! !